Shelling the nuts is an awesome fine motor activity that is enormously time-consuming, and picking and storing the nuts requires planning and organization. More than motor planning, determination, and executive function however, the planning for the gifts gives him the opportunity to think about others and to imagine their response to his gift. He is then in a situation where it is natural to think about the perspective of others and the time he puts into this rather arduous task is a demonstration of his caring toward others. This gift has value for both the giver and the completely appreciative recipients. Christmas is such a huge opportunity to think about others… and I want my child to be able to have the opportunity to practice, appreciate, and feel empowered by this. And then… considering another perspective: I went to the source and did a little interview with H – who is now almost 13. Can you tell me what you would like for Christmas? For Christmas I want Nika to be here. But other than that, I’d like a pair of nunchucks or a set of weights… or an ipad. What do you think a kid who is 6 years old would like? Probably a dog – well I wanted a dog when I was 6 because I didn’t have much friends. What about a kid who is 8? A kid who is 8 would maybe like a Nintendo DS 3D. Actually – I would like one of those too. It would be cool, but I kind of want an ipad. There’s this new app that, uh… (turns on laptop here… to google it) called Harry Potter Magic where you can get different wands and when you wave your ipod (not an ipad) it makes different spells. It even has multi-player duelling and has all 23 spells. You have to make a Z, see?? And there is House Sorting so you can even use the Sorting Hat. Maybe the Annoying Orange Kitchen Carnage, or Harry Potter Magic, but I have really just started researching and exploring this. What is better an ipad or an ipod? An ipad is better – big time. Isn’t it very obvious? You can actually hear the sounds and it is bigger. It is easier to touch the screen. With an ipod you can’t hear it unless you have headphones. What is the purpose of Christmas? Well… it’s like this… it is not about the gifts – it is not about the presents – it is about having your family. I don’t really care if I have an ipod or an ipad or anything – all I really care about is that Nika is here. That is all I really want. So sweet… He has often grasped these big ideas in a way that I think is well beyond his years. This kid has a big heart – something that is not always visible in his everyday interactions due to his level of social anxiety, sensory issues, or uneven seeming response to a world that comes at him unevenly. 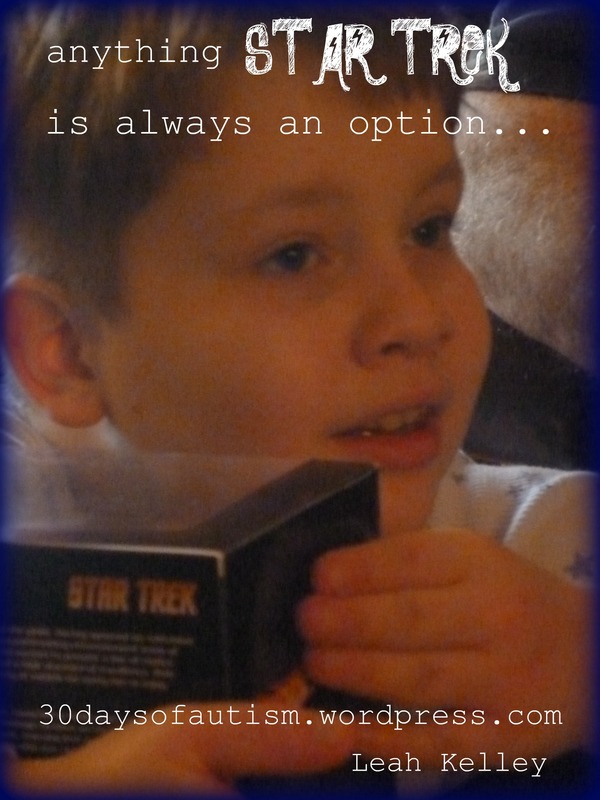 Here is H last year with the much coveted Star Trek Enterprise. 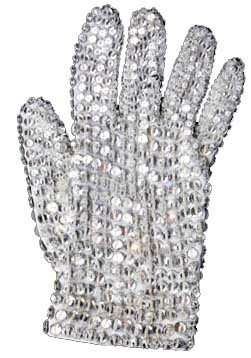 Although he did n’t mention this in the interview – I happen to know that this year he would also like a white fedora and a sparkly Michael Jackson glove. 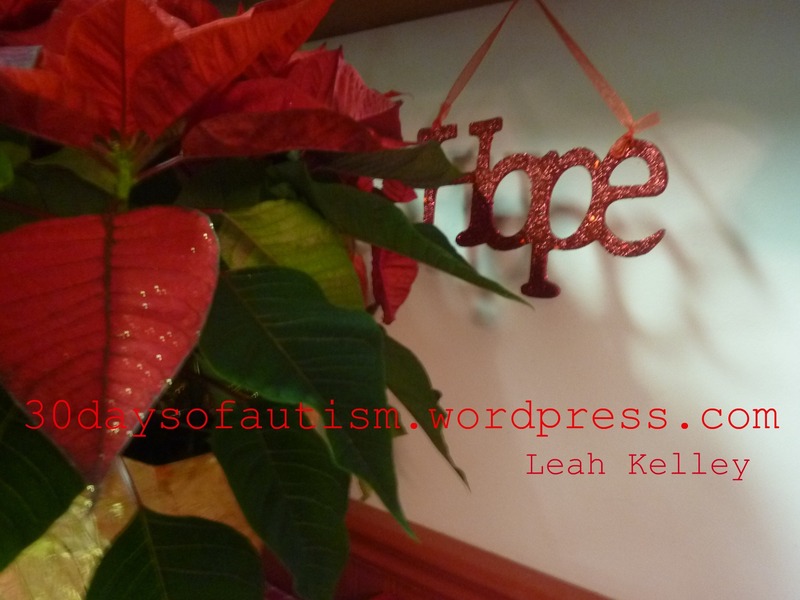 This entry was posted in Anxiety, Aspergers, Autism, Big sister, executive function, sibling, Star Trek and tagged Autism, Christmas, gifts, hazelnuts, love, sensory overload, Special Saturday, Star Trek. Bookmark the permalink. For the last three Christmases, and this one too, we have sponsored a family in need. We always pick one with a single mom and little girl Megan’s age. Then I have her pick out presents she thinks the girl would like, based on information her mom has given us. It gets her thinking about what others might want. I also let her bring one of the wrapped presents for the girl to open in front of Megan so she can see how much the girl enjoys it, even if it was something Megan wouldn’t choose for herself. To me that is totally the spirit of Christmas… thinking of others and giving your child the opportunity to give and to understand the perspective, challenges, and wishes of others. How lovely that you are able to sponsor a family and provide Megan an appreciation for other people’s experience that might be different from her own. 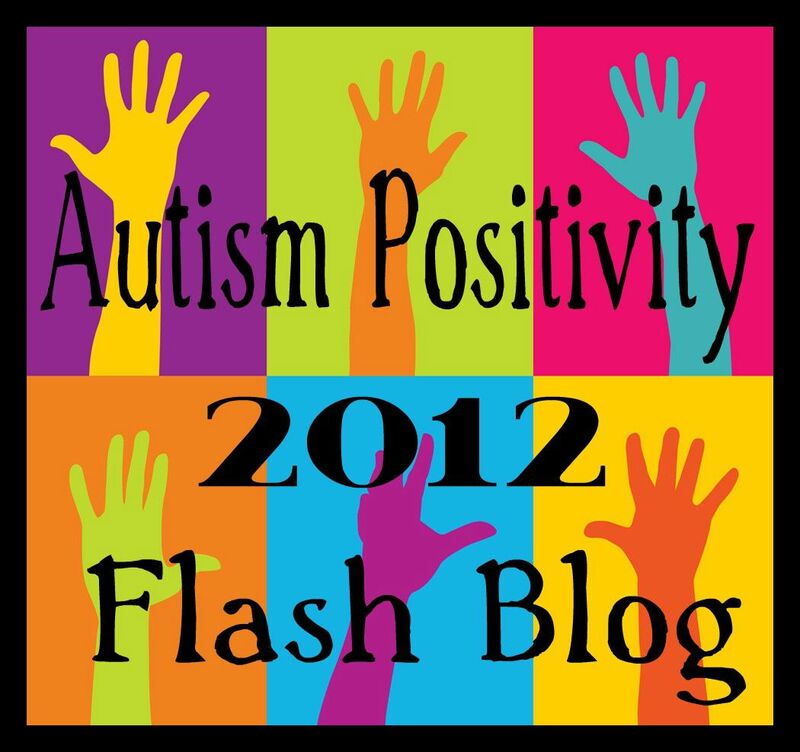 What fabulous learning for a child with autism… or any child!! Thank you Mark. I appreciate your comment and support!